Product code: ES2925 Categories: Sold Items, Sold Jewellery. Antique cameos are just like a painting in that they are always so individual and unique as no two cameos are ever the same and here is a magnificent antique cameo that is so finely carved the detail is extraordinary and the setting that it is in is also magnificent to admire. 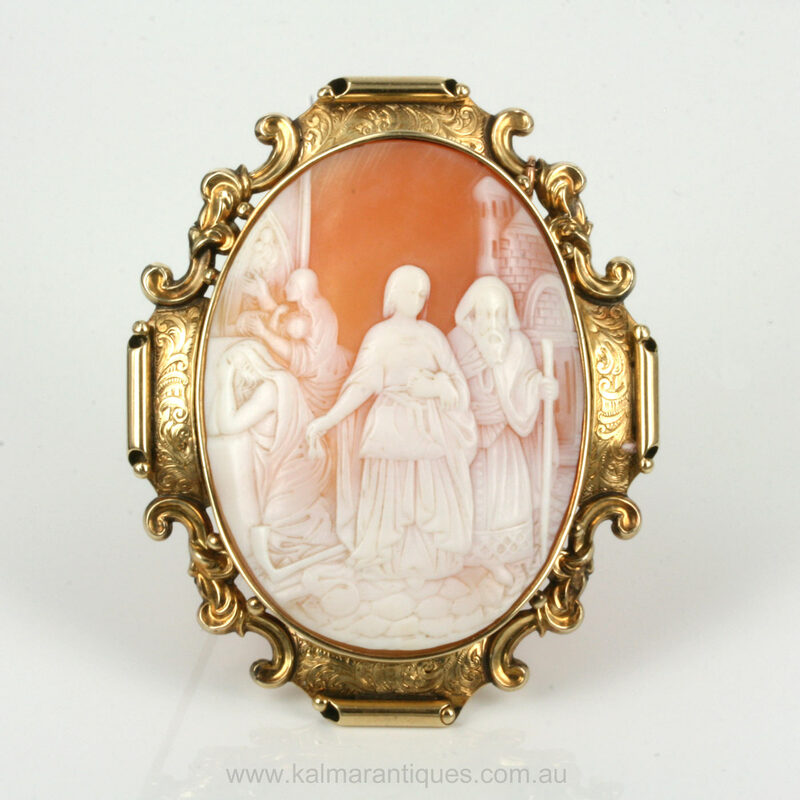 Made in 15ct gold in the 1860’s, the cameo is hand carved from shell and depicts a classical scene of a woman guiding a blind man. The detail from the robe, the cane, the beard and even the facial features is amazing and is what separates a good cameo from a superb one such as this. As if this wasn’t enough, there is even more detail and character in this cameo with a woman holding a baby as well as a man kneeling. This detail in cameo is just superb and to think that it was all carved by hand is just wonderful. The cameo is surrounded by the most wonderful and intricate hand engraved mount that looks so well with the cameo and is very typical of the Victorian era jewellery. 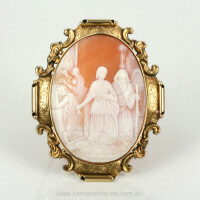 The cameo itself measures 4.2cm by 5.7cm and the mount 5.7cm by 7.1cm. And to make this antique cameo brooch even more exciting is the fact that it is presented in its original velvet lined box. The box measures 8.2cm by 9.5cm and the cameo fits perfectly inside. 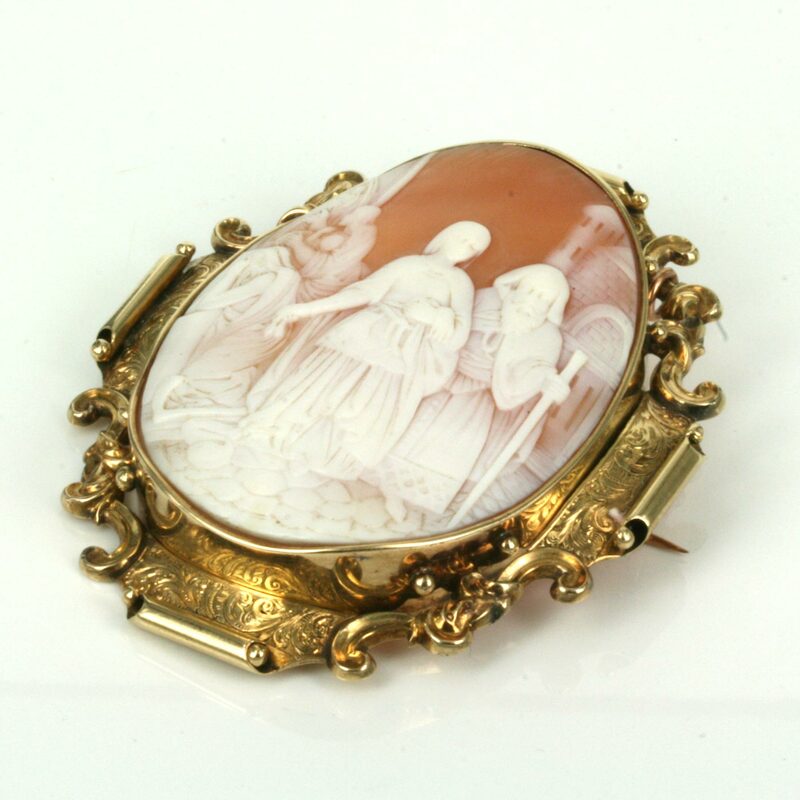 This is a superb quality antique cameo brooch with so much attention to detail and will always look good on any outfit.